I had another wonderful gift this week: my dear friend Kelly surprised me with a visit! Last Sunday morning, I picked up the phone to hear that Kentucky accent say, “Can you pick me up at the airport tomorrow?” Umm, you bet I can! What time? Turns out we haven’t seen each other in over two years (shame on us! ), so it was quite the reunion. I was really happy her visit coincided with me feeling pretty good – not to mention that she and I have a long history of dining out together and loving to eat! So, since I’m still trying hard to gain weight before surgery, she was the perfect person to inspire me to eat (and eat, and eat). Our first stop was The Shed for green chile enchiladas. I was a tad nervous about putting green chile into my system again, but I decided just to go ahead and live on the edge! That first bite was a little shocking (I haven’t had anything remotely spicy in months) but the rest of the meal was so delicious I nearly finished the whole enormous plate! And, thankfully, I didn’t seem to have any trouble with the green chile later either! Downtown Subscription – Mexican hot cocoa! We managed to squeeze in some other fun besides eating. 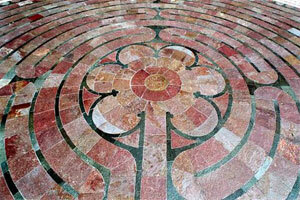 We walked the labyrinth at St. Francis Cathedral on Thanksgiving morning. We discovered some sweet Christmas gifts at one of my favorite consignment shops, Recollections. We watched movies, read magazines, and chatted by phone with our Kindred Spirit goddesses (Carol, Michelle, Karen H, and even Clare – in Ireland!). All-in-all, it was a lovely visit, with a good balance of recreation and relaxation. Just what the doctor ordered! Thank you, Kelly, for the truly wonderful and very healing visit. Sure do love you! Dear friend, trust me, the visit fed me as much as it fed you! Wow, we ate all of that in just a few days?? haha. I am not suprised. Being with you again reminded me of the beautiful synergy that happens when you and I get together; especially when we are in Santa Fe! I’m home now and pooped, but smiling from ear to ear, so glad we have reconnected. Just remember your strength, sister, it is there even when you can’t readily see/fee it. And, just take one step at a time on the rose path-it’ll guide you to wherever you need to be. I LOVED reading about my Kindred Sisters having such a wonderful time. And…I felt full just reading about all the good food you had. YAY!~ You got to eat!! I love how we are all connected and I am forever grateful to you Karen and all our sisters, for the love and acceptance that I have found with ya’ll. I will be praying extra hard this week as you go toward the next step in your healing. So sweet! What a happy time for the two of you — I miss you both! So glad that you ladies had such an awesome (and tasty) time together. Much to be thankful for, yes? I do believe that (with Kelly’s help) I will be right on the money vis-a-vis your fighting weight at the main event. Good going gals! Love ya, babe. See you soon. Just have to tuck in one more comment. Sooo many of us are with you in spirit as you prepare for another big step in your healing. I send you lots of love, healing, prayers and strength. You ARe an awesome Goddess and sister and friend. and I love you muchly!